Astronauts have attached two science experiments to the outside of Europe's Columbus module at the International Space Station (ISS). Rex Walheim and Stanley Love were making the third and final spacewalk of the current Atlantis shuttle mission to the orbiting outpost. The men fitted an observatory to study the Sun and an instrument suite to investigate the space environment. Atlantis is now due to undock from the ISS on Monday and land on Wednesday. Walheim's and Love's spacewalk lasted seven hours and 25 minutes. 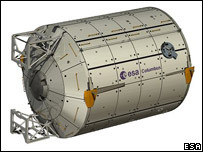 Their goal was to position the Solar observatory and the European Technology Exposure Facility (EuTEF) on two exterior racks at the end of Columbus. 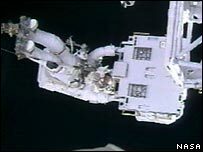 They achieved their objective with the aid of the space station's robotic arm which was being driven from inside the platform by astronaut Leland Melvin. The exterior scientific payloads on Columbus will be changed over from time to time in the coming years. There is room for four separate payloads at any one time. Solar will look at the Sun across a range of wavelengths. EuTEF carries nine individual experiments that investigate how the harsh environment of space affects various biological samples and materials. Some of these studies will aid the future production of more robust spacecraft; others will test theories on how life might have evolved in our solar system. Walheim and Love also moved a failed gyroscope from its storage location on the station to the shuttle's payload bay for return to Earth. In addition, the spacewalkers examined a small chip on a handrail near the ISS's Quest airlock to determine whether it could have been responsible for the glove damage experienced on recent spacewalks. The men also installed handrails on Columbus. Between now and Monday's departure of Atlantis, the 10 astronauts currently on board the ISS will work on commissioning the Columbus lab. The US space agency has added a 13th day to the mission to give the astronauts as much time as possible to do this. Columbus is the first segment of the ISS that Europe will control, through a ground station in Germany. 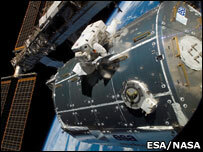 Its installation means the European Space Agency (Esa) becomes a full member of the ISS project and gains "rights" to positions on the platform for European astronauts. In the short term this will work out at one six-month residency every two years. Once the 1.3bn-euro ($1.8bn; £0.9bn) lab is fully commissioned in a few weeks' time, an intensive programme of research in weightless surroundings will begin. The scientific studies inside the module will impact diverse fields, from crop breeding to the development of advanced alloys.